This July 2016 my house has ceased, at dusk, to look like the one painted by Magritte in “L’Empire des Lumières” in 1954 (my birth year). The street-lamps have been substituted: the big ball that used to light the façade from the middle has been replaced with led lamps on higher stems. In the meantime I started to work on Arcan #16 that I have provisionaly named “Re-vault” . It’s a soft textile bust of Sky and Sea that I am preparing for a performance for the twenty years from the death of Goliarda Sapienza, the author of “The Art of Joy”. She will be remembered in Gaeta on August 30th. “Re-vaults” features the night heaven with Antares of Scorpio and the theme of fertility underneath. It continues and widens the work on the Tarots. 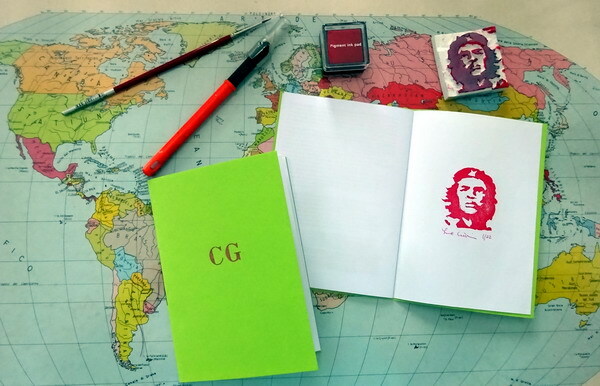 A series of 22 little instant books about “Che Guevara” with original rubberstamps in it, is also ready. These follows the booklet “LC: Laura Cristin for Letizia Comba” that was given out at London Biennale opening in Rome and through the mailart. Around the 22 of July, in coincidence with the 80th B.day of my friend Dawn Redwood, I will renew my pilgrimage to London. This time, the Brex-it broke my memory of the first imprintings of freedom received there, in the ’70ies. Though, I will get acquainted with the community center of Kingsley Hall where Letizia Comba met Ronald Laing. There, in the place run by the Leisters since the early ‘900, the heaven has seen many peaceful artenative revolts even before the psychiatric one, like the suffragettes’ or the march of hunger. Mahatma Gandhi stayed there for 12 weeks.